The International Committee of the Red Cross has announced that it plans to implement a 50% cut in family visits for Palestinian men prisoners beginning in July 2016. Over the objections of Palestinian prisoners’ associations and international advocates, the ICRC has used budget limitations in order to justify the cutbacks in family visits. Palestinian prisoners are now announcing a boycott of ICRC representative visits to the prison, demanding an end to the cutbacks and the preservation of twice-monthly family visits. Also, see below for two accounts by Palestinian prisoners, Wael Jaghoub and Thaer Hanani, about the ICRC’s role in the lives of Palestinian prisoners and neglect of their concerns. The ICRC’s involvement is necessary in order for most Palestinian families to visit their imprisoned family members. Palestinians in the West Bank need special permits to visit their imprisoned family members inside Israel, where most prisoners are held in violation of the Fourth Geneva Convention. These permits are often delayed or denied and take months to process; if and when they are approved, Palestinians must visit on special ICRC buses arranged twice monthly. The entire visit process begins early in the morning and ends late at night for a 45-minute visit; it is very difficult for young children and elderly parents. Samidoun reiterates that the International Committee of the Red Cross should be working to bring an end to the Israeli obstructions of family visits, and the Israeli violations of the Geneva Conventions, beginning with the location of imprisonment for the vast majority of Palestinian prisoners, rather than placing the weight of budget cuts on those most vulnerable and least able to bear it – Palestinian prisoners and their families. Palestinian families have no other means of securing family visits. The ICRC family visit program is their only option – and this decision removes 50% of Palestinian families’ access to this essential lifeline. The Handala Center for Prisoners and Ex-Prisoners reported that Palestinian prisoners across political lines will soon be issuing a united position on the ICRC visit cutback, noting that this comes “within the framework of a tightening noose on the Palestinian people and an attempt to liquidate their issues, whether the struggle of the refugees or the prisoners.” The center stated that prisoners are discussing a boycott of the ICRC and its services in rejection of this unjust action, saying that people must be mobilized around the world to expose the ICRC’s complicity with the Israeli state’s repression of Palestinian prisoners. Tareq Abu Shalouf of Mohja Jerusalem Foundation said to Asra Voice that Palestinian prisoners will boycott the ICRC by rejecting visits with ICRC representatives in the prison, saying that prisoners’ organizations outside prison will be sending letters and holding protests in rejection of the cuts. 1. Sign and share the change.org petition to the International Committee of the Red Cross urging them to change this decision. 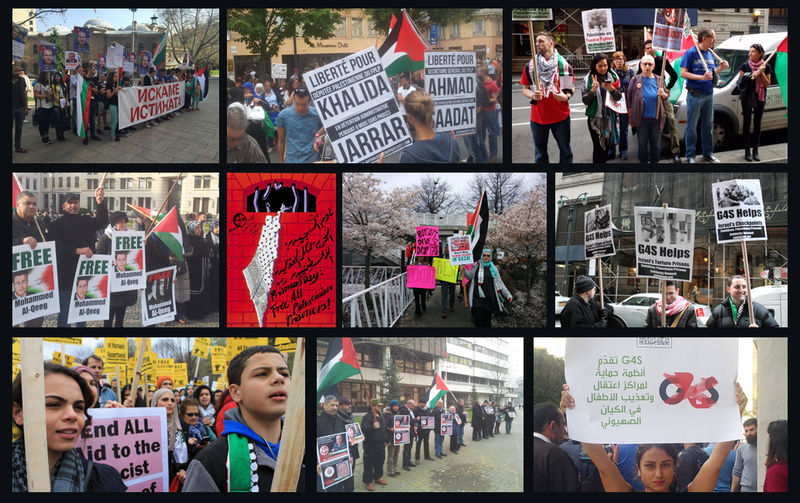 Palestinian prisoners and their families need support – not yet more roadblocks in the way of family life and family connections! I was not surprised when I learned of the news of reduced visits, the decision taken by the Red Cross, which is supposed to play an important role in our lives as prisoners, based on its duties as an impartial, independent international organization with an exclusively humanitarian mission, to protect the lives and dignity of victims of wars and occupation, as well as advancing international humanitarian law and other humanitarian missions. We as prisoners and our families do rely on the Red Cross for its humanitarian role towards us as prisoners, but rather than carry out its duties and responsibilities, to push to increase our family visits, here, the ICRC stands alongside the enemy to the point of identical positions of the ICRC and the Israeli Prison Service, to reduce family visitation. The ICRC knows very well that we as a movement fought long battles and strikes to achieve two visits per month, and forgets all of the pain and suffering of Palestinian prisoners for this achievement. First, I was allowed a visit once every six months for first-degree relatives, but my father was excluded on the grounds that he was not a “first-degree relative.” The Red Cross did not lift a finger. My family lives now in Jordan. I did not hear anything from the ICRC; on the contrary, they asked the ICRC more than once to provide some needs such as clothing, photographs and other correspondence, but the ICRC did nothing. Upon the death of my mother, I learned after the ICRC did not inform me that there was a permission for my mother to visit me that had been approved for a year! Even now my father has visited me twice only, and permitted to visit my brothers Nidal and Jihad twice only. The ICRC has no comment. All that and more comes alongside the decision of the ICRC to reduce visits at the same time that many, many prisoners are suffering from the denial or lack of visits. I am one of the prisoners who is suffering from this scarcity. So long as this happens, the ICRC does not respect its most basic mission, but, on the contrary, colludes with the occupation. There is an urgent need for the ICRC to understand its humanitarian duties toward the prisoners, to look for ways to support us to communicate with our people. I have written here of the problem with visits from my point of view. If you ask any prisoner, of the thousands of prisoners, about this topic, you will find that there are thousands of anecdotes and stories in which the ICRC is failing to fulfill its humanitarian responsibilities, if not plotting with the occupation. It is also worth mentioning the suffering endured by our people during visits with no intervention from the ICRC, including visit denials, lengthy inspections, delays, and abuse at checkpoints. Finally, the ICRC should be fulfilling its duties to expand, not reduce, visits, not to mention the many existing problems of our prisoners which the ICRC fails to ameliorate, which include the denial of access to cultural and scientific books, sports equipment, messages and letters, as well as the suffering of sick prisoners and the medical file generally. For several years, the International Committee of the Red Cross has been working to reduce its services to Palestinian prisoners in the prisons and detention centers, including reducing services previously provided, such as the introduction of mathematical educational materials, newspapers and cultural books, and entertainment media. This comes in addition to reducing the support for family visits and the visits of doctors to the prisons. This comes in the context of the ICRC’s announcement to reduce the family visits to prisoners to once monthly, which it has justified by citing budget restrictions and the numbers of families able to visit their children twice monthly. Since the beginning of the aggression of 2014, sanctions have been imposed by the prison administration on family visits, including the prisoners belonging to Hamas and also those residing with them in the relevant sections from the Popular Front, Islamic Jihad and the Democratic Front. Nearly 2,000 prisoners were allowed only once monthly visits. We heard nothing from the ICRC, neither in Geneva or in Palestine, to shed light on this arbitrary action or to seek to bring it to an end. The policy of “security prohibition” of first-degree relatives from visiting their family members in prison. This policy affects all prisoners, there is no prisoner who is not impacted by bans prohibiting visits by wives, parents, siblings, and children. There are hundreds of prisoners prevened from receiving visits. The Red Cross does not address this issue at all and stays completely apart from this systematic denial of visits and visit permits. Orders denying prisoners family visits for six month periods, or the denial of family visits as retaliation for prisoners’ protests, defending themselves and their dignity. These orders are carried out against groups of prisoners as well as against individual prisoners, as which happened with Ahmad Sa’adat, the General Secretary of the Popular Front, who was prevented from family visits for years continuously. The ICRC declined to issue a position on this policy. The torture and abuse suffered by families during visits, during inspections at the prison gates, including the tearing up of visit permits, and procedures which make family visits a true experience of suffering. The ICRC has done nothing to stand by Palestinian families. The denial of introduction of shoes and other materials such as clothing during visits, reducing the amount allowed, leaving the prisoners prey to the “canteen,” where Israeli companies define the prices of consumer products with no restriction. The ICRC has said nothing about this economic attack on the prisoners and their families. The prevention of “second-degree relatives” from visits, allowing only first-degree relatives, is not considered by the ICRC to be a violation of the rights of prisoners and a means to isolate and segregate them and to engage in collective punishment against families. They are silent on this matter. The prevention of any other means of communication aside from the visits, including the prohibition of telephone calls for Palestinian prisoners. The ICRC does not see this as a violation of the human rights of political prisoners. The prevention of isolated prisoners from visiting their families; there have recently over 20 prisoners in solitary confinement forbidden from seeing their loved ones. The ICRC has issued no objection, complaint, statement or report on this flagrant violation of rights. The visitation to prisoners from Gaza, prohibited for over five years, resuming in 2012 following an open hunger strike of thousands of prisoners for 28 days that won them visitation once every two months with selected first-class relatives. The ICRC was silent on this issue for years until forced by the action of the prisoners. There are dozens of mothers of the prisoners who cannot visit their children due to ill health. the ICRC does nothing to provide an appropriate means of transit or transfer or to pressure the occupation to move their children to jails nearest their homes. The ICRC does not see this suffering and does not act to provide means to overcome it. Through all these previous points regarding the visits and the procedures of the ICRC concerning them, we look back at the offer of prison management in 2013 to provide once monthly visits for all in exchange for improvements in the conditions of daily life. This was rejected firmly by the prisoners; and it was responded to by achieving visits twice a month. This was an achievement through the suffering of prisoners and months of strike, despite Israeli prison administration pratices against them and santions imposed on them. Today we find that the ICRC complies with the Israel Prison Service administration in regards to family visits in the same manner that the IPS previously tried to impose. This action directly serves the prison administration’s policy of isolation of prisoners and reduction of all forms of communication with the outside world. There is also a questionable situation regarding the timing of this action, which coincided with a fierce campaign by the IPS against prisoners through inspections, and the transfer to special sections in Ramon, Eshel, and Nafha prison, and the use of special repressive units. The Israeli prison administration has confirmed that this policy will escalate and include other actions. It should be noted here that these raids have occurred on visit days and that the prison administration informed the ICRC, which postponed the visits in advance, while saying that the delay was due to prison administration decisions to conduct repairs in prison sections. The ICRC’s decision is a step that requires us to confront it, through public events before the ICRC headquarters, through petitioning, and through official moves on the level of the factions, the PLO, and the Authority. These arbitrary decisions by the ICRC must necessarily be confronted by Palestinian steps. Following this decision, there will be other decisions to follow, complementary to the targeting of the prisoners’ movement, the isolation of prisoners, and cutting their limited communication. The ICRC must bear its responsibilities in this phase amid a comprehensive targeting of Palestinian prisoners in the prisons. Now we need a serious discussion and struggle for the protection of prisoners.